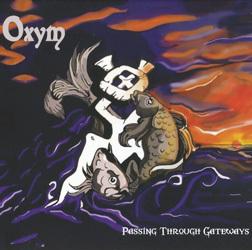 Undoubtedly one of the highlights at this year’s Brofest, Oxym were one of the many NWOBHM bands who never released an album back in the glory days. One single – ‘Music Power’ b/w ‘Mind Key’ – and the track ‘Hot Rain’ on the ‘New Electric Warriors’ compilation was as good it as it got before, like so many of the great bands of the time, they inevitably hit the buffers; and to further compound the band’s ill-fortune their original bassist Ross Halliwell was killed in a motorbike accident in 1979, and vocalist/guitarist Rob Rigby passed away in 2011. However, and again like so many great bands of the time, Oxym had a fair few songs up their collective sleeves which had been endlessly rehearsed and honed into shape through countless live shows, and ‘Passing Through Gateways’ is a romp through this back catalogue recorded by the band as it is now, with original members Phil Lord (guitar) and Mik Wilson (drums) and Halliwell’s replacement Nigel (Tolly) Talbot joined by frontman Peter Joe Hulmes and guitarist Doz McCarthy. On the evidence presented here, Oxym were another of those bands for whom the phrase ‘what if…’ springs to mind. Being in the right place at the right time might have seen them at least have a crack at going the distance, but at least now – if their performance at Brofest is anything to go by – they’ve got a second shot at showcasing their material to an ever-growing legion of appreciative NWOBHM fans. Despite being recorded some thirty years after they were originally written, none of the songs on ‘Passing Though Gateways’ have lost their fresh-faced NWOBHM appeal, and it sounds as though the guys have deliberately elected to play them straight, meaning they sound as naïve and exciting as they would have done in a Lancashire club in 1980. Songs like the effervescent ‘High Speed Loser’ and catchy-as-crabs ‘From The City’ really do encapsulate the sound of the early Eighties; ‘Buy The Time’ with its nifty time-change and Maidenesque middle section is as exhilarating as it comes, and the driving ‘Witch Hunt At Salem’ is pretty much worth the price of the CD alone. It’s a nice touch that the album plays out with the original ‘New Electric Warriors’ take of ‘Hot Rain’, recorded in 1980 and featuring the Rigby / Lord / Talbot / Wilson line-up as nod to the band’s roots and a tribute to Rigby’s contribution to the band.